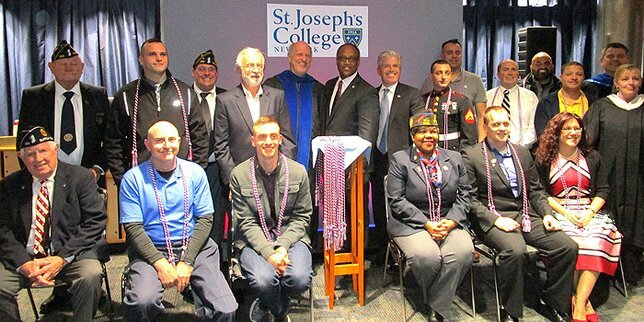 Presiding Officer DuWayne Gregory served as the keynote speaker for the St. Joseph’s College Military Graduate Recognition Ceremony at St. Joseph’s Long Island Campus on March 30. Amityville, NY - April 10, 2017 - Suffolk County Legislature Presiding Officer DuWayne Gregory recently served as the keynote speaker for the St. Joseph’s College Military Graduate Recognition Ceremony at St. Joseph’s Long Island Campus. The event celebrated the graduation of 50 military-affiliated students from St. Joseph’s Long Island campus. Graduates representing each of the five armed service branches (Air Force, Army, Coast Guard, Marine Corps, and Navy) were in attendance, including active members, veterans, reserves, spouses and dependents. "St. Joseph's College NY was honored to have Presiding Officer Gregory address our 2017 military-affiliated graduates,” said Erin D'Eletto, Director of the Office of Military & Veteran Services at St. Joseph’s College. “This year the College proudly commends the academic achievements of fifty military and veteran students. Tremendous credit goes to the graduates, as well as a heartfelt thank you to the college and community for the significant contributions made to support the educational empowerment of those that have served and sacrificed." Subject: LongIsland.com - Your Name sent you Article details of "Suffolk Legislator Gregory Serves As Keynote Speaker For St. Joseph’s College Military Graduate Recognition Ceremony"